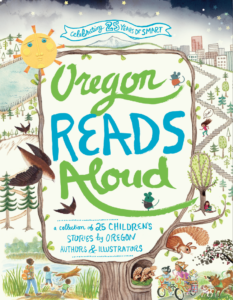 I am thrilled to be part of this wonderful anthology, OREGON READS ALOUD. This gorgeous book, containing 25 stories written by Oregon authors and illustrated by Oregon illustrators, is a celebration of the 25th anniversary of SMART: Start Making a Reader Today. This nonprofit pairs adult volunteers with children for read aloud time. 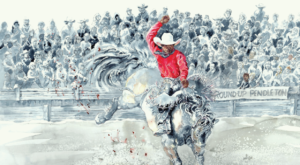 My story is about George Fletcher, an African American saddle bronc rider, who was declared the People’s Champion at the 1911 Pendleton Round-Up. It’s a bit of Oregon history that I am so pleased to share with you. The incredible illustrations are by artist Wendy Myers. Find your nearest bookseller here. An activity guide linked to state education standards is available as a pdf here.